Our existing customers range from civil engineering contractors to general builders/trade through to utility companies and members of the public. We offer all types of concrete mixes, no matter how large or small the project is. One of AMS’s strengths is our reliability. 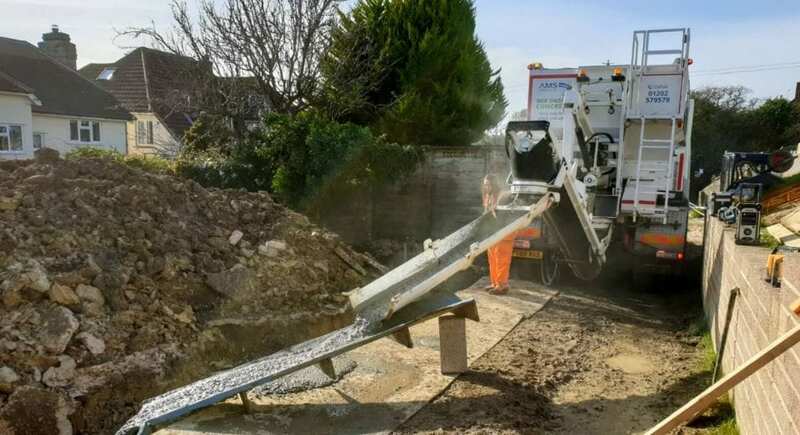 We recognise that it is highly important to deliver concrete to your sites at a time that suits you. Our supply of ready mixed concrete is designed very much with you, the customer in mind. If you prefer a mix onsite service, we can supply a volumetric mixer. A volumetric mixer is essentially a mobile truck, mixer and concrete batching plant rolled into one. All the raw materials are stored in separate compartments and these are then measured and mixed into fresh concrete when and where it is needed. This means there is no expensive waste of materials, as the unmixed products remain usable indefinitely, so you only pay for what you use. Do you need help to decide the correct concrete mixe or amount to order? Then please call AMS on 01202 579579 and speak with any of our experienced concrete specialists. Superior expertise, competitive prices and the ability to small and large loads locally.